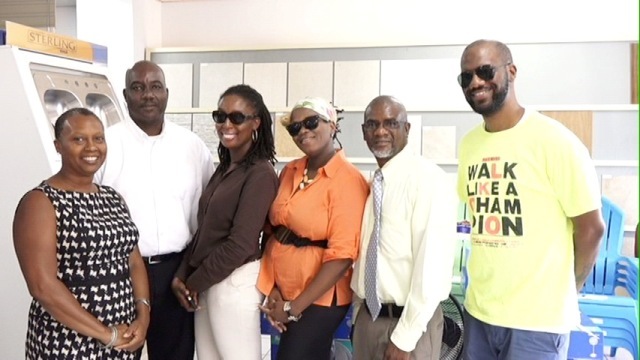 NIA CHARLESTOWN NEVIS (July 23, 2015) — S. L Horsford and Company Limited made monetary contributions to two Culturama 41 participants – Kore Entertainment and Royal Rampage troupe – during a brief handing over ceremony on July 21, 2015, at the S. L Horsford Nevis Centre at Marian Heights, Nevis. Culturama is an annual celebration of Nevis’ culture. This year’s official calendar of events will commence from July 23 to August 15. Retail Manager at the Centre Carlisle Pemberton said the Company was pleased to provide sponsorship for the defending Road March Champions the Kore Band for a second consecutive year. The cheque was presented to Kore Entertainment representative Cory Tyson, who said the Kore band was grateful for the partnership with S. L Horsford and Company Limited and expressed hope it would continue in the future. General Manager at the Centre Oscar Walter, presented a cheque to Royal Rampage Troupe. He noted that Royal Rampage had done justice in promoting both S. L Horsford Nevis Centre and Culturama over the past two years and he was pleased to have the company sponsor the troupe for a third year. Walters took the opportunity to wish everyone a happy and safe Culturama 41 on behalf of the S.L Horsford Group of Companies. The cheque was handed over to Royal Rampage representatives Seba Jones and Rifka Maycock-Harding. In response, Jones noted that they were thankful for the sponsorship for a third time and pledge to make the Company proud. Also present at the ceremony was Chairperson of Culturama 41 Deborah Tyrell.